The young ‘Nellie Melba’ moved with her family to Queensland in 1881, living around the Mackay sugar region until fleeing the tropics in 1883 to launch her singing career in Melbourne. Her two years in Queensland were miserable. Despite this, the ‘Melba myth’ remains central to the heritage tourism industry in the town of Marian, part of the Pioneer Valley. Helen Porter Mitchell, or Nellie Melba as she would later be known, was born in Melbourne. After her mother’s death from illness and the sudden death of a sibling, Melba moved to Queensland early in 1881 when aged twenty, with her father David Mitchell and her sister Annie. David Mitchell moved to the Mackay region because he obtained a job there as the builder of a new sugar mill near Mackay. Melba, or Helen as she was still known, quickly became well known in Mackay society, she and her sister wore the latest fashions, and Melba’s singing and talent with a piano also made her popular in Mackay society. Although Melba’s singing would later become world famous, in Mackay she was considered second in vocal talents to another young woman of the region. By December 1882 Melba married Charles Armstrong in Brisbane. After a long honeymoon in Melbourne, staying at Melba’s family home at Doonside, Melba and Charles returned to the tropics and she moved with her husband to a small house near the Marian Mill, where Charles was the manager in March 1883. March was the wettest month of the year, and the rains poured down for several more weeks before easing in mid-year. The tropical climate seems to have played a key role in Melba’s impressions of Queensland. The wet tropical summer with its high humidity and days of rain not only had a detrimental effect on Melba’s mood but also upon her prized possessions. Her piano fell to pieces due to the mildew which invaded her home. The tropics contributed to Melba’s later bitterness about the weather and environment of the Marian region. Melba was disconsolate from the heat, humidity and wetness which surrounded her small home. To bathe in the river her path took her through trees and the natural habitat of snakes, frogs and other creatures. The river itself was not only home to leeches, but, according to rumour, crocodiles. Of course this was when the river itself was not in flood as many tropical rivers are during the summer and autumn months. Although the years that Melba was in the Mackay region were not the wettest, or the hottest on record, or even in comparison to other parts of the nineteenth century, they were certainly a change from temperate, cool Melbourne. By the end of 1883 Helen Porter Mitchell Armstrong fled from the heat, the poverty and the creatures of Queensland’s tropics back to Melbourne, the city from which she took her stage name as Nellie ‘Melba’. The central place of Melba House as the visitor information site in Marian depicts Melba’s role as a famous, if somewhat unhappy, resident of the small town. 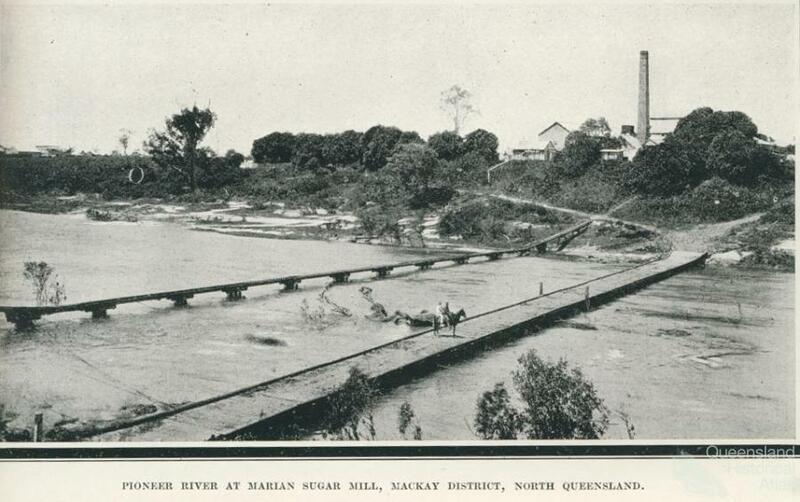 Her presence during the early 1880s is seen as important in the history of the region’s establishment as a centre for the sugar cane industry. Today her fame is used to attract tourists to the region. Whatever length of time the central figure in a local story stays in an area, they need to have at least two tangible attributes to become a key part of the ‘heritage’ process - the ability to attract outside interest and the ability to be the central point from which the story of a place and a period can be told. Melba’s presence gives the small town of Marian an icon around which to build its story. Melba House which was to be demolished has now become the heart of Marian’s new role as a heritage town in the Pioneer Valley and acts a museum to Melba in the 1880s. The town remembers Nellie Melba, and indeed the town lived in Melba’s own memory. Despite her rejection of life in the tropics, Melba had an ongoing relationship with the region, sending money to help repair cyclone damage to the local church.